Top row, left to right: Michael Di Pentima (Executive Board Member), Duncan McDonell (Executive Board Member), Steve Di Nardo (Recording Secretary), Shawn McLaughlin (Secretary-Treasurer). 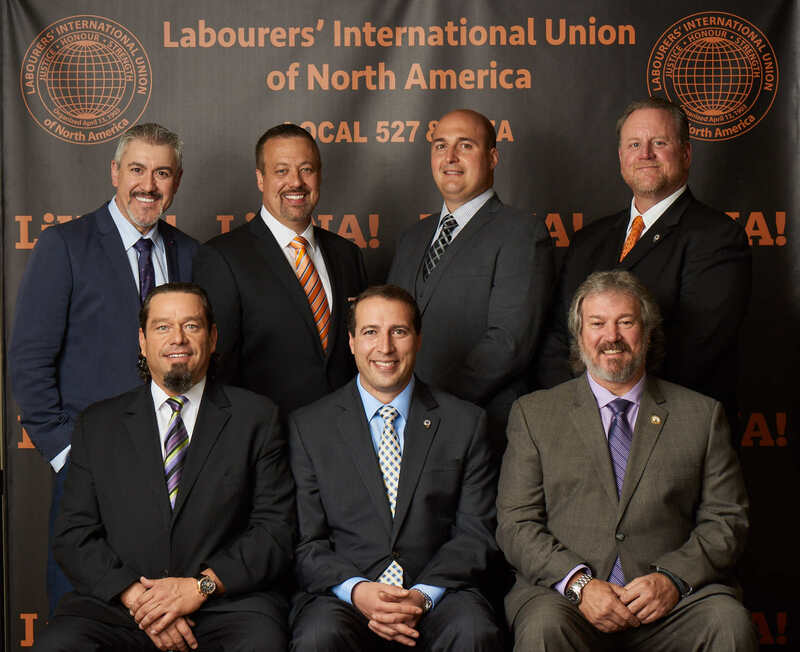 Bottom row, left to right: Carlo Trunzo (Vice President), Luigi Carrozzi (Business Manager), Robert Da Silva (President). We value our relationship with our members and affirm our commitment and support to them, as their daily work makes our communities a better place to live. We are here to ensure their rights and to improve their working conditions. Representing the interests of over 4000 members in the LiUNA Local 527 – 527A jurisdiction, we will continue to work hard to ensure that unionized employers abide by the terms of the collective agreements and by the health and safety and human rights laws; we will continue to represent them well and will take the necessary steps and procedures to resolve complaints against a union employer for the violation of the collective agreement(s) and laws that affect any member.